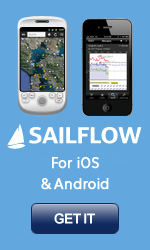 The SailFlow region shown is xt_USA. This Wind Obs + Marine FX map represents observed and forecasted surface values at specific locations at selected time intervals. The map displayed corresponds to xt_USA local time as stamped in the upper right corner of the map. "N/A" indicates data not available. For detailed information on each site, including exact time of observation, simply mouse-over the site for a data pop-up. You may also click on a site for wind graphs, tides, meteograms, sensor notes, and more. A wind vector pointing down represents wind blowing from north to south, and is commonly referred as a "north wind". A yellow direction arrow denotes observations from the WeatherFlow network. A red flag indicates a forecast only site. Observations are reported from various other sources including the National Weather Service (NWS), National Ocean Data Buoy Center (NODC) and numerous additional institutions. For credit information on non-WeatherFlow sites displayed on this map, please click on the site of interest. Forecasted values are produced by the WeatherFlow Forecast Modeling System and contain proprietary data and technology protected by all Copyright laws. Please read and understand disclaimer before using this information.